Culture is a huge part of any organization, and it can make a big difference on the type of talent you attract to your business. This is one of the reasons why it’s so important to invest in the “health” and effectiveness of your organization’s culture, ensuring that your company’s mission and culture are not only clearly defined but upheld. According to the infographic, “Is Your Company Culture Threatening Your Success?” by Express Employment Professionals, although 84 percent of employees reported being happy at work in 2013 and 86 percent felt valued by their companies, just 15 percent of workers strongly believed their companies’ defined cultures were upheld. The infographic also revealed that there was a disconnect between leaders and employees last year when it came to organizational culture. It showed that while 65 percent of executives believed a business’s financial performance affects culture, only 24 percent of employees held that sentiment. And because many executives didn’t see this trending disconnect with staff, 36 percent of employees, the infographic noted, were looking to jump ship within the next year. “Establishing a clearly defined company culture from top to bottom is key to having an engaged workforce and turning the tides in the turnover battle,” the infographic said. And the first step ensuring your culture is clearly defined is through examination. Culture is a way of life of a given group of people passes down from one generation and/or time period to the next through learning and experiences. The same is true in business, and every workplace has its own unique culture. In 1976, Edward T. Hall equated culture to an iceberg, with culture having internal and external components. The external part of culture, or above the surface, include our social norms. These include outward behaviors, such as music, art, greetings, food and drink, dress, manners, rituals, etc. The internal portion, or below the surface, include cultural norms, such as environment, time, action, communication, space, power, individualism, competitiveness, structure, thinking, values, and customs. Like in any iceberg, the external, visible part is only a small portion of the entire iceberg. The external portion of your organization’s culture, for example, is just a small portion that others can see. Yet, the internal part—which accounts for the majority of your company’s true culture—is usually hidden or much harder to see although it drastically affects the entire culture. 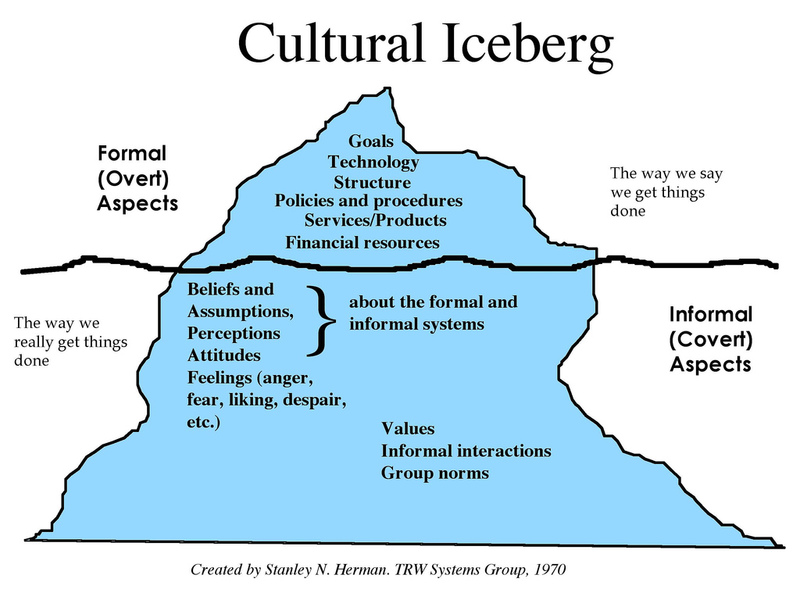 A great example of a business iceberg model of culture was created by Stanley T. Herman of the TRW Systems Group. In his example, the external part of a business’s culture is the formal (overt) aspects, or the way we say we get things done. These include areas like goals, technology, policies and procedures and financial resources. The internal part is called informal (covert) aspects, or the way we really get things done. This section of an organization’s culture includes areas like values, informal interactions, group norms, and the perceptions and attitudes about the formal and informal systems. To examine your company’s culture, take a good look at your internal and external components. Does your internal culture—how you portray your culture—align with your external—how your culture really is— or are they totally different? After you understand the definition of culture and its structure, you can finally move to an in-depth assessment. And what better way to assess than to ask (and answer) some important questions? To help with this, below I have listed 11 questions to ask yourself when examining your organization’s culture. Really take time to think about each question, analyzing your current systems and practices regarding each question. How do you advance new ideas? How do you advance up the career ladder? How healthy and effective are lines of communication: With your peers? With your supervisor/manager? With leadership? 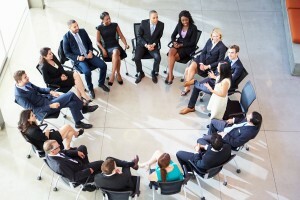 How do you convene important meetings? What are personal/professional threatening actions or behaviors in your culture? How does your culture deal with cross departmental interactions? What are cultural taboos in your organization? How does the organization culture handle conflict? How does the organization recognize success? How do you get support or buy-in? How does your culture manage and/or value diversity?